In the first, second, third, fourth, and fifth parts of the series, you created the networking infrastructure and the start of the game, including dealing cards, choosing the start player, and allowing the player to flip cards over. In this sixth part of the series, you’ll implement the logic to allow players to take turns, deal with networking edge cases such as out-of-order packets, and start implementing the Snap feature! Right now, the app will only let a single player turn over cards. That’s a bit sad for the other players, so in this section you’ll give the other players a turn! That is typical for card games: the players take turns, so you’ll have to come up with a mechanism that makes players active turn-by-turn and then send the results of whatever this player did to everyone else. There are two situations you need to handle: when the player who is also the server turns over a card, and when a player on a client turns over a card. In the latter case, the client needs to tell the server that the card has been turned over (in the first case, the server obviously already knows). This turns the card for the active player and then schedules the activateNextPlayer method to be called after a small delay. I chose to use a delay here because that looks better in combination with the card turning animation. You only want to activate the next player when the CardView has been fully turned over. When the client player turns the card. In single-player mode (more about that near the end of the tutorial). This loops clockwise through the player positions until it finds a valid Player object, and then activates that Player. Because you call the activatePlayerAtPosition: method, this will also send a PacketActivatePlayer packet to all clients. You can only call activateNextPlayer on the server. That should do it for the server. If the server’s player is the starting player (and for testing purposes you can fake this by always setting _activePlayerPosition to PlayerPositionBottom in pickRandomStartingPlayer), then tapping to turn over the card will activate the next player, also on the clients. Try it out! Of course, turning over a card on a client does not activate the next player yet, because the client does not tell the server yet about this event. For this you’ll introduce a new packet type, PacketTypeClientTurnedCard. If the packet came from the currently active player (defensive programming! ), then you should turn over the card for it. Notice that this will only turn the card on the server but the client will never show the cards that the server turned over. With two or more clients this also runs into problems, because client B will never be told that client A turned over its card. You call turnCardForActivePlayer to turn over the card for the previous player, but not if this client itself was the previous player (i.e. the one in the bottom position) because that card has already been turned manually by the local user. After that, you call the new activatePlayerWithPeerID: method to activate the next player with a delay, which again looks better in combination with the card turn animation. Try it out now. Whoops, if the starting player is the server’s, the client will now flip over a card even before the server player has tapped on anything! 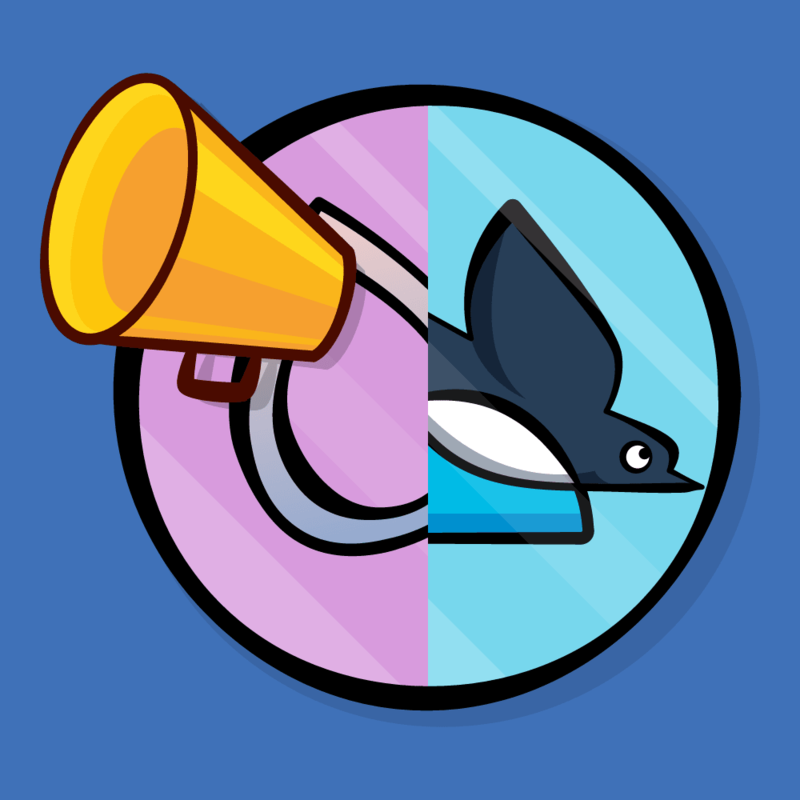 When a new round starts, the starting player has already been activated. In that case, you don’t need to do anything here and you can simply ignore the ActivatePlayer packet. Try it again, first with one client, then with two (or more). Each player in turn can now flip over a card, and all players should show the cards of the others being turned over. Verify that all devices actually show the same cards. There are still a few small issues that you have to resolve, though. If you tap fast enough, it is possible to turn over several cards at once! That’s against the rules of Snap!, so you should prevent that. Set it to NO again in activatePlayerAtPosition:, because that activates the next player. At that point this new player obviously hasn’t turned over his card yet. 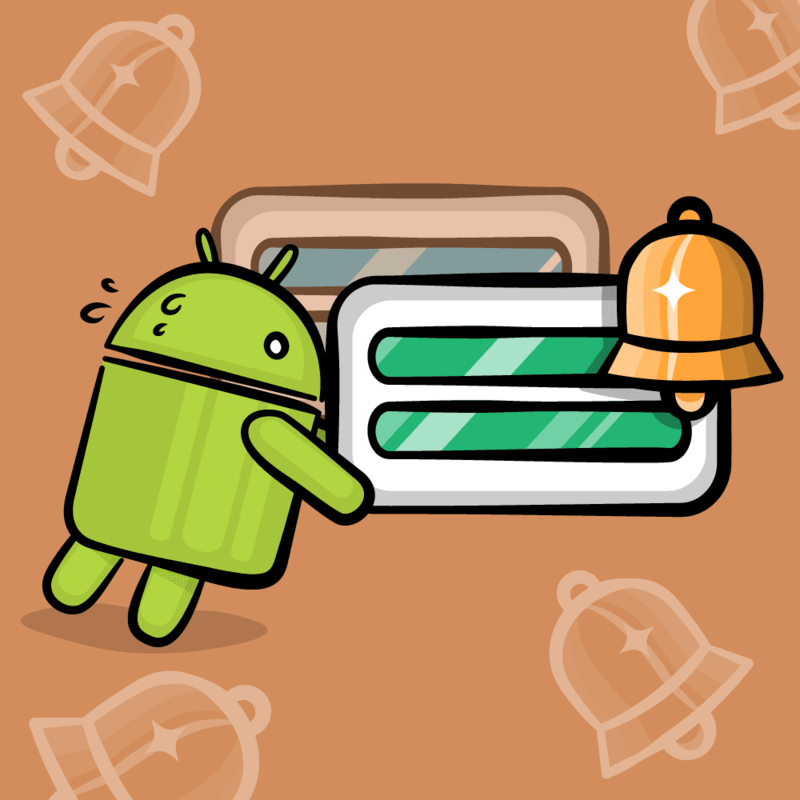 The _busyDealing flag prevents the player from turning over cards while the dealing animation is still taking place. This is where the game state is a bit misleading, at least on the server. It changes from “dealing” to “playing” when all clients have responded with a ClientDealtCards packet, but usually this will happen quicker than the dealing cards animation. If you were to tap on the stack in the interval between having received all those packets and the animation completing, it is possible to already turn over a card. Try it out. Rapid tapping during or after the dealing animation should no longer flip over more than a single card. All right, the game is starting to shape up! It already has many of the basics that most card games need, i.e. taking turns and flipping over cards. 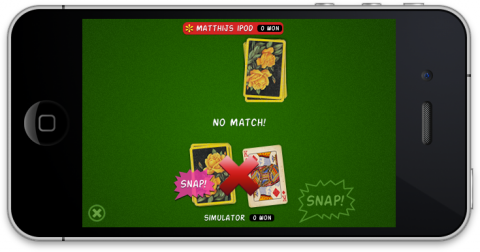 You still have to handle what happens when players run out of cards — currently you can’t do anything anymore when that happens — and allow the players to yell “Snap!” when they tap the Snap! button. But before you get to that, you should make the networking code a bit more robust. You’ve already seen that networking is full of surprises. For example, you never know when a client is going to disconnect so you need to be prepared to handle disconnects at any given time. You also cannot trust the peers that you’re connected to, so it makes sense to validate any packets that you receive. There is another thing that you should be aware of: packets may not actually arrive in the order that you sent them. GKSession can send packets in one of two modes: reliable mode and unreliable mode. So far you’ve been using reliable mode for all our transmissions, which means that no matter what, as long as the connection exists, that packet will be delivered with exactly the right contents. If the packet transmission fails, GKSession will try sending that packet again. But if you’ve sent more than one packet, and packet A fails while packet B doesn’t, then packet B may arrive at its destination before packet A. Whether this is a problem or not depends on the application that you’re writing. For Snap!, you’ve already largely solved this packets arriving out-of-order problem by building in several synchronization points. For example, the server asks all clients to sign in, and then waits for their responses before it continues. Then it sends them the ServerReady packet and again waits until all clients have responded. There is no way the server can receive the ClientReady response before the SignInResponse because it will never send out the ServerReady packets until it has all “sign-in” responses. However, you can’t really use such a synchronization mechanism during the actual gameplay. That would require the clients to send acknowledgments for every packet from the server, which will make the game a lot less responsive — since it would need to do a lot of waiting — and a lot less fun. An alternative approach is to simply ignore any packets that arrive “out-of-order”. If packet A arrives after packet B, then you simply pretend that you never received packet A. This approach is mostly useful for games that send continuous status updates, such as real-time action games. For example, if the packets contain position information of your game objects — let’s say spaceships — then a packet with older data should be discarded because it is no longer relevant. For Snap! a potential out-of-order problem exists: if the order of ActivatePlayer messages gets messed up, then a client may see that first player Y is activated, followed by player X (this is the message that is out of order). It should ignore the activation for player X because it is obviously an old message. However, the client needs to retroactively perform player X’s turn as well — you can’t just skip that player. To detect whether packets arrive out of order you have to number them. If a packet with number 99 arrives after packet 100, then it should be discarded. That’s what the 32-bit “packet number” field is for in our Packets. In Snap! you will only use this field for the ActivatePlayer packets, but in some games you may want to use this mechanism for all packets. If packetNumber is set to -1, then you will not use the out-of-order detection mechanism. This is true for most packets. And that’s it as far as sending is concerned. Each packet that you send out gets a unique number that keeps increasing. You will set this to -1 in the init method, because the first packet that this player will receive has number 0. This was the first step. Now you actually have to make the game smart enough to recover from an ActivatePlayer packet that gets discarded because it is out-of-order. After all, on the client you turn over the cards for the other players upon receipt of the ActivatePlayer packet. If one of those packets gets skipped, then one of the players does not get his cards turned. So you have to recognize when a player was skipped and then do something about it. // For faking missed ActivatePlayer messages. You need to test this with at least two clients. When you run the app now, every other ActivatePlayer packet will be skipped by the client who sits at the top (as seen from the server). It only gets the ActivatePlayer packet for the player after that, and the player in between is skipped. So how do you solve this? You know that a client can never miss its own ActivatePlayer message, so that is a good synchronization point. The reason it can never miss its own ActivatePlayer message is that there can be no messages sent by the server after that, as the client first has to send a ClientTurnedCard response back to the server, and the server waits for that. // local user) who has more than one card. // Skip players that have no cards or only one open card. This new code calculates which players should have their cards turned. Usually this will be the player immediately next to the newly active one, but if any ActivatePlayer messages got lost, then it also includes those skipped players. Try the app again with two clients. The one at the top (from the server's point-of-view) still drops ActivatePlayer messages but the next time it does receive an ActivatePlayer message, it makes up for that loss and turns over the card of the skipped player. All right, once you've verified that it works, comment out (or remove) the code for faking the dropped messages. Note: Handling out-of-order packets can be pretty nasty. When you design the communications protocol for your game you should take this into consideration from the beginning. What will you do when packets arrive in the wrong order, simply drop the "old" ones or somehow integrate that older data back into your model? 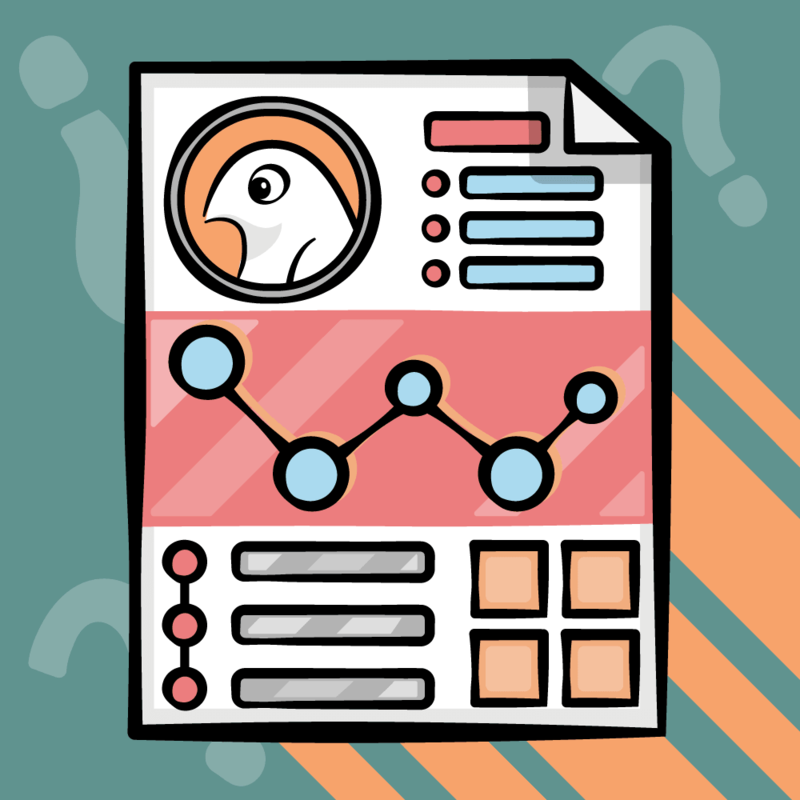 And what if you discard those older packets, how do you make up for the data that you are missing out on? What is best here really depends on the type of game you're making. If your head didn't explode yet from all this hard thinking, then now is a good time to take a break before you continue with the actual game logic. What happens when a player runs out of cards? According to the rules of Snap!, he takes his pile of face-up cards and flips it over, so these now become his closed cards again. I named this process "recycling" and you'll have to add a nice animation for that. This means the player's cards should be recycled when he has no closed cards left and at least more than one open card. You don't recycle the cards when there is just one open card because that is a little silly, the player will just be turning over that same card all the time. Now the question is, where do you check whether the player's cards need to be recycled? I decided a good moment is when the next player is activated. If this new player has no more cards to turn over at that point, you first recycle his old cards. This now loops through all the players until it finds one that still has cards left to turn over, or cards that can be recycled. Note that this skips players who have just one open card. This is pretty simple, it calls a new recycleCards method on the Player object, and then notifies the delegate so that it can do an animation to move the cards from the open stack back to the closed stack. As you can see, recycleCards is actually implemented in terms of another method, giveAllOpenCardsToPlayer:. 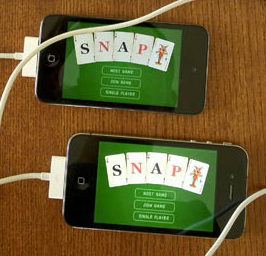 That is because later on you will also need to move those cards around when another player yells "Snap!" and wins the cards -- it's the same logic, whether the source and destination player are different or the same person. Game calls this delegate method with the list of cards that were recycled (you got that list from Player's recycleCards method). You simply call the animateRecycleForPlayer:withDelay: method on each CardView from the list of recycled Cards. Then half a second later you call afterRecyclingCardsForPlayer: to resume the game. I simply commented out the starting value (CardAce) and replaced it with CardQueen. Now there will be only eight cards in the deck (four queens and four kings). Of course you do have to remember to restore this back to the original value when you're done testing! Try it out. When a player runs out of cards, on his next turn the cards are recycled and moved from his open stack to his closed stack again. Except... it doesn't work on the client yet. Awesome, now it works on the clients too. You're not quite done yet. Imagine what should happen here: you're in the middle of a game and one of the other players suddenly disconnects (for whatever reason). What happens with the cards that player was holding? For the game of Snap! you cannot simply let those cards disappear because then it may be impossible to finish a round. Instead, that player's cards need to be redistributed to the other players. That is what you will do in this section. To accomplish this you will give the clientDidDisconnect: method a second parameter named redistributedCards:, which is an NSDictionary of peer IDs and Card objects. On the server this dictionary will be nil, which tells the server it still needs to calculate how that player's cards will be redistributed, but on the client the dictionary tells the client which player (peer ID) gets which new cards. // Tell the other clients that this one is now disconnected. // Give the cards of the disconnected player to the others. // Add the new cards to the bottom of the closed piles. The logic in this method is quite similar to what it did before, but now you also use the redistributedCards dictionary to give the new cards to the remaining players to put on their closed piles. If the disconnected player was also the active one, then you have to activate the next player. This is the method that returns the dictionary of cards. The structure of this dictionary is similar in principle to the dictionary that you used with PacketDealCards. The keys are peer IDs that identify a player, and for each player there is an array of Card objects. Note that players who no longer have any cards left at all, open or closed, do not longer participate in the round. They are skipped when redistributing the cards. The first enumeration block in this method adds the peerIDs for the players who will receive cards to the dictionary and gives each of them an empty (mutable) array. Then you enumerate again but this time through a list of the disconnected player's cards. As long as there are cards left, you pass them out among the remaining players. Finally, you return the dictionary object. Still a few errors to go. The PacketOtherClientQuit packet now also needs to include the dictionary of redistributed cards, because you need to send this list to the remaining clients. In theory they could calculate this redistribution by themselves as they have all the pieces of the puzzle -- each client knows which cards all of the other players have -- but for educational purposes I decided to send them the full list of cards. All right, that takes care of the packet. Now the GameDelegate. Previously you had a delegate method game:playerDidDisconnect:. That method now needs to get a new parameter so you can pass it the dictionary of redistributed cards as well, for a nice animation so that the user actually sees what is going on. This simply looks up the CardView for each redistributed Card and tells it to perform an animation that moves the card from one player to the other. Run the app with just one client and the server, and then disconnect the client after the cards have been dealt. You should now see the client's player disappear from the server and his cards (both open and closed) fly to the server's closed pile. Also notice that the server's player should become active if it wasn't. Note: It's always a good idea to test the simplest situations first, which in this case is with just one client and on the server only. Once the server side part works, test it on the client side, then test with multiple clients, and so on. Problems are easiest to debug when you find the simplest situation possible that reproduces the problem. Also, very complex situations may actually hide issues that you don't notice because so much is going on at once. On the server this works fine because the Card objects there never change. For example, the Card object at address 0x1234 used to belong to player X and after moving it around it now belongs to player Y. On the client, however, the Card objects do change. When you receive the PacketOtherClientQuit packet, it reads the suit and value from the incoming NSData object and gives those to a new Card object that it freshly allocates! In that case, [self cardViewForCard:card] will return nil because there is no CardView that currently points at that Card object. After all, you just made that new Card object from scratch. And that should do it. Try the app with at least three players (two clients and one server). Now when one of the clients disconnects, his cards should be redistributed among the two remaining players. Because it is vital that all participants keep their card stacks in the same order, you should tap through all the cards after the disconnect to see if what the remaining client shows is the same as what the server shows. (This is easiest if you test with a smaller deck.) Later on, when it's actually possible for players to lose cards you should also test the situation where one of the players has no cards left; he shouldn't get any of the disconnected player's cards. Note: The source code from this tutorial works pretty well but it's not perfect. Hopefully it shows you the sort of things that you need to think about when you're writing multiplayer games. It's often the weird edge cases that make network programming hard. One situation that isn't handled very well by Snap! is the following: if multiple clients disconnect at around the same time, the card redistribute messages may arrive in the wrong order. Small chance, but it could theoretically happen -- after all, nothing is guaranteed when networking. You could handle this with the packetNumber scheme, but that may conflict with the ActivatePlayer packets, causing the message that activates the client itself not to be guaranteed anymore (because that ActivatePlayer packet could be dropped if it arrives out-of-order with an OtherClientQuit packet). There are a couple of ways to solve this issue, but this tutorial is already long enough. Suffice to say, multiplayer network programming can cause a lot of headaches! There is a match and you're the first person to yell "Snap!". You will now receive the complete stacks of open cards from the players who hold the matching cards. These cards will go on your closed stack. There isn't a match. You will now have to pay all other players one card from your closed stack. As always you'll start simple and slowly build in all the required features. Simple in this case means that tapping the Snap! button always counts as "no match" and whoever tapped the button will have to pay cards to the other players. Next up is the showSplashView:forPlayer: method. The "splash view" is the smiley face that shows up when the "Snap!" was correct (self.correctSnapImageView) or the big red X that shows up on a wrong Snap! (self.wrongSnapImageView). These two image views are part of the GameViewController nib but so far they have been hidden. What showSplashView:forPlayer: does, is move the image view over to the player's position, show it with a "splash! "-type animation (hence the name), and then remove it again. That should be enough to try it out. Tapping either on the server or a client should work, although they don't communicate with each other yet. Notice that you temporarily disable the UIButton that is used for turning over the cards after you've tapped the Snap! button, just so the user cannot mess with our animations. Currently there is no code yet to re-enable that button, but you'll fix that in a moment. This figures out which player you're talking about and then calls the playerCalledSnap: method again. Try it out! Tap the Snap! button on the client and watch a speech bubble (and for now, the big red X) appear on the server. Congratulations - you've got the game almost working! 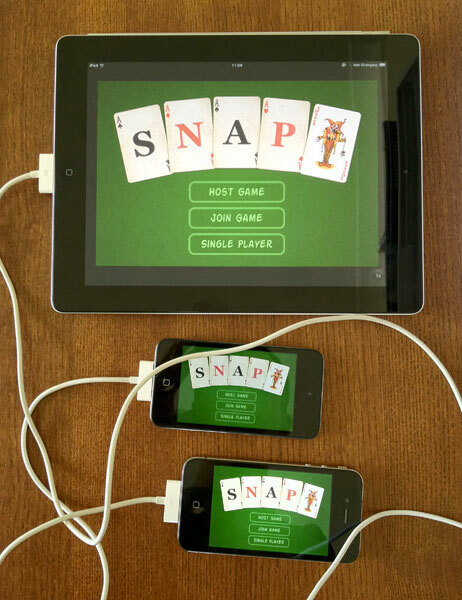 The cards are dealt, the players take turns, and you can even call Snap! Next, check out the seventh and final part of this tutorial series, where you'll finally wrap up the rest of the game!